Nokia has added another handset that is Nokia 6303i Classic. Nokia 6303i Classic phone is an updated version of the Nokia 6303, with features 2.2 inch QVGA display, 16 million colors, 55MB of internal memory and microSD card slot with a capacity of 2GB. 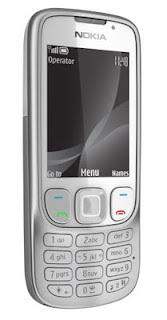 Nokia 6303i specifications which include stainless steel casing that comes in silver and gold. Another feature of the Nokia 6303i Classic handset including a 3.2 megapixel camera, video recording at QVGA @ 8fps, compared VGA @ 15fps which is the original version of the 6303 classic. Nokia 6303i Classic mobile phone will be sold with price range around 105 Euros or 145 U.S. dollars.